Fragile babies born pre-term will now benefit from highly advanced respiratory equipment to support their healthy development, thanks to the generosity of TB Vets Charitable Foundation. On Thursday, October 13, TB Vets Representative Kandys Merola presented Sasha Carter, Manager of Planned Giving with KGH Foundation, with a cheque for $12,512 to be used towards the purchase of nine Neopuff Infant Resuscitators for the new perinatal unit at Kelowna General Hospital. The state-of-the-art devices are used to revive infants using artificial respiration. The lungs of babies, particularly those of premature infants, are incredibly fragile and susceptible to collapse. Collapsed lungs can happen when, during resuscitation, pressure is either too high or inconsistent. 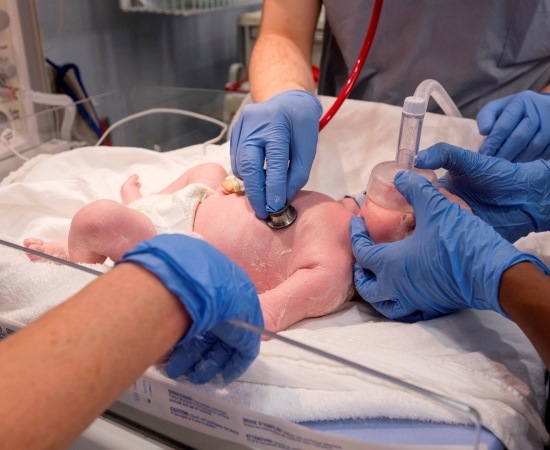 The Neouff device gives the medical care team the ability to more consistently measure the pressure inside a baby’s lungs, greatly increasing patient safety. Over 1,600 babies are born at KGH each year. The new Perinatal Unit opened in March 2016 and with the help of donors has become the most advanced in the Southern Interior Region—providing world-class care to our littlest patients.